Carbon dioxide (CO2) is produced as a normal byproduct of metabolic processes in cells and normally diffuses into the bloodstream to be exhaled from the lungs. There are times, however, when an excess amount can build up—a condition known as hypercapnia, which is also referred to as hypercarbia or carbon dioxide retention (CO2 retention). There are many possible causes of hypercapnia, including conditions that result in the production of more carbon dioxide (such as infections or trauma) and those that result in the reduced exhalation of the gas from the lungs (such as some lung diseases). Ordinarily, the body carefully regulates the amount of carbon dioxide in the blood. When carbon dioxide levels become elevated, there are special receptors that detect the increase and, in turn, send messages to the brain to breathe more deeply or to move so that airflow is not obstructed (this is why people move at night if their mouth and nose become covered by a blanket). Due to these regulatory pathways, medically significant hypercapnia in otherwise healthy individuals is rare. There are a number of medical conditions that may be responsible for hypercapnia, and some of these may do so through more than one of the mechanisms at play when CO2 builds up in the blood. Generally speaking, when we breathe, we inhale oxygen and exhale carbon dioxide. 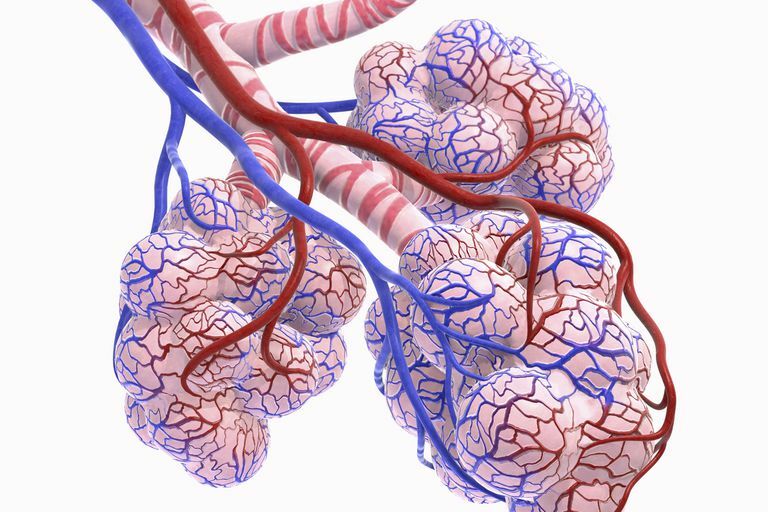 These two respiratory gases are exchanged deep within the lungs in tiny, grape-like clusters, or air sacs, called alveoli. In people with COPD, this process is impaired because the alveoli are destroyed, leaving less surface area for oxygen to get from the lungs into the bloodstream and for carbon dioxide to get from the blood into the lungs to be exhaled. This results in a low amount of oxygen in the blood, a condition called hypoxemia, as well as hypercapnia. This retention of carbon dioxide in people with COPD is due to the inadequate exchange of gases that results from V/Q mismatch in the lungs. COPD is a major cause of hypercapnia, though not everyone who has COPD—even severe or end-stage disease—will develop this concern. With respiratory depression caused by an overdose of narcotics, or with degenerative neurological conditions, the brain does not respond to commands to increase breathing as it ordinarily would. As a result, CO2 can accumulate in the blood. Since these symptoms are all non-specific, having awareness is important so that the condition is not missed. The diagnosis of hypercapnia begins with a careful history and physical exam, combined with having a high index of suspicion that the condition may exist. The condition is usually diagnosed based on the results of an arterial blood gas, with a CO2 pressure of 45 mm Hg or above being diagnostic. An increase in carbon dioxide in the blood also lowers the pH of the blood (causes acidosis), a condition referred to as respiratory acidosis. Other tests may be used to look for the underlying cause of hypercapnia. The treatment of hypercapnia depends on its severity. Supportive care treatment options are often needed while physicians address and treat (when possible) the underlying cause of the condition. Noninvasive ventilation: Noninvasive ventilation provides ventilatory support through the upper airways. It enhances the breathing process by giving the patient a mixture of air and oxygen from a flow generator through a tightly fitted facial or nasal mask. Intubation and mechanical ventilation: Intubation is the process of inserting a special tube (an endotracheal tube) through the mouth and then into the airway. The tube then gets hooked up to a mechanical ventilator that takes over active breathing for the patient. Hypercapnia can lead to respiratory failure and death if left untreated. If you have COPD, a major risk factor for the condition, being aware of the symptoms of hypercapnia is key to early detection. Call your doctor as soon as possible if you experience any change in your symptoms or general health, especially if you notice profound fatigue, a decrease in concentration or confusion, muscle twitches, or palpitations. Fortunately, it's fairly easy for a physician to detect the problem quickly if present. Talking about hypercapnia can be confusing, but the important take-home points are that people who have lung disease should have a high index of suspicion; seeking medical care if they note any symptoms at all and that urgent medical treatment is needed if carbon dioxide levels are elevated in people with other medical conditions. Feller Kopman, D., and R. Schwarzstein. Mechanisms, Causes, and Effects of Hypercapnia. UpToDate. Updated 09/08/17. West JB. Causes of and compensations for hypoxemia and hypercapnia. Compr Physiol. 2011 Jul;1(3):1541-53.